Wisdom of Life. : The five senses for buying & selling. 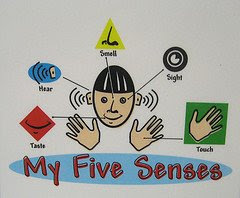 In any buying and selling, the five important senses are required. They are the sight, smell, taste, touch and voice. These are the buying and selling signals, depending on the products or services render. Through sight or visual is the easier and fastest means to sell. A catchy and sensational car model could tempt most interested buyers. No property could be sold without the illustrative design or preferable an exact model home for viewing. Delicious food is taken by smell and taste. You can never explain the smell of durian, until you have one in hand. Seeing a beautiful dress is nice but without touching its fabric, the lady might not buy it. All tangible products are sold through sight, smell, taste and touch, which I consider as easy transaction sales. However intangible product like life insurance cannot be sold by the above four senses, except through voice by talking, visualising, discussing, debating, arguing and listening. Life insurance cannot be seen but it can be explained in words. It is a lasting product which has to be visualised in segments of time and needs. It cannot be smelled but you have to imagine the fragrance of flowers that surround the family. It is tasteless, yet it is so sweet when the peace of mind is gathered. Is only the contract papers that can be touched, but are spelled the hopes and dreams which offer promises and assurances. Is not an easy product to sell, because it needs a truthful voice with understanding, kindness, sincerity, honesty and patience of the heart to make it real and alive. If you are selling life insurance, are you using this voice to communicate? A Chinese Proverb - "A filthy mouth with not utter decent languages."